May 3, 2016 , 5 Comments on Dapper Day! Over the weekend I got to attend my first Dapper Day at Disneyland! And it was both amazing and overwhelming! But first, what is Dapper Day? 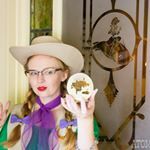 Dapper Day is a twice yearly “unofficial” (as Disney has no part in the planning) event that happens at three Disney parks; Disneyland, Walt Disney World, and Disneyland Paris. While each park has different days throughout the year, each park has it twice a year, and it is simply a day where Guests are encouraged to dress, you guessed it, “dapper”. Now, personally, nearly every day is Dapper Day for me, but it’s nice to have a dedicated day to go to the park and see so many other well dressed people! While this was my first Dapper Day (between not visiting during one, and working while it occurred after the move) this one meant a lot and required a special outfit. Some of you might recall my post, Ribbons for Sam, that was about a fundraiser to help my dear friend Samantha of Match Accessories, who was recently diagnosed with leukemia, and her family to make it to Dapper Day for the first time as Guests, as their previous visits during Dapper Day were as vendors at the Dapper Day Expo. And they made it! So, a HUGE thank you to helped make that happen! Their being there meant I really wanted to wear my special ribbon brooch for the event! So I planned my entire outfit around it. The color orange and I typically don’t get along, so I have little of it in my wardrobe, and decided to simply accessorize with it, pairing it with more flattering green and white. Per usual, it was slated to be sunny, and just days before I thought about wanting to make a Shere Khan parasol, just because he’s one of my favorite villains. Patrick then mentioned, “Shere Khan is orange…” so I whipped up a Shere Kahn parasol as another orange accessory for the day. Near the end of the day Match organized a meet-up so we could show our love and support for Samantha and her family, and we snapped a group shot, but there were so many people taking the photo that I swear at least a third of all who showed up are not in the shot! As for the Dapper Day Expo, I came home with a few brooches, including ones from Match, yet another Mexican tourist jacket, and another pair of Re-Mix shoes. But I could have spent loads more! How many of you have been to a Dapper Day at a Disney park? I know some of you have! Brooch: Courtesy of Match Accessories, thank you so much for including me! What a fun tradition. More places should have Dapper Days! Love your outfit, especially your parasol!! This was the 1st Dapper Day I’ve missed in several years, but I’m enjoying looking at everyone’s pics. Hopefully I’ll make it to the fall Dapper Day in November. 🙂 Thanks for sharing your outfit with us!! The orange touches pop against your mint green dress! I love it! What an awesome outfit and way to further help bring attention to what your dear friend and her family are going through. You’re a beautiful soul, Janey. Lovely outfit … and I love the Shere Kahn Parasol.